When I was 10 I wanted to be a stewardess, pilot, astronaut, lawyer, doctor, someone amazing! I work as a Research Assistant and M. A.Sc. Candidate in Electrical and Computer Engineering at Carleton University. I am proud of earning the Governor General’s Academic Medal and organizing activities to foster girls’ interest in STEM! Empowering girls is essential! Leading hands-on activities at events like Go ENG Girl with CU-WISE is amazing. 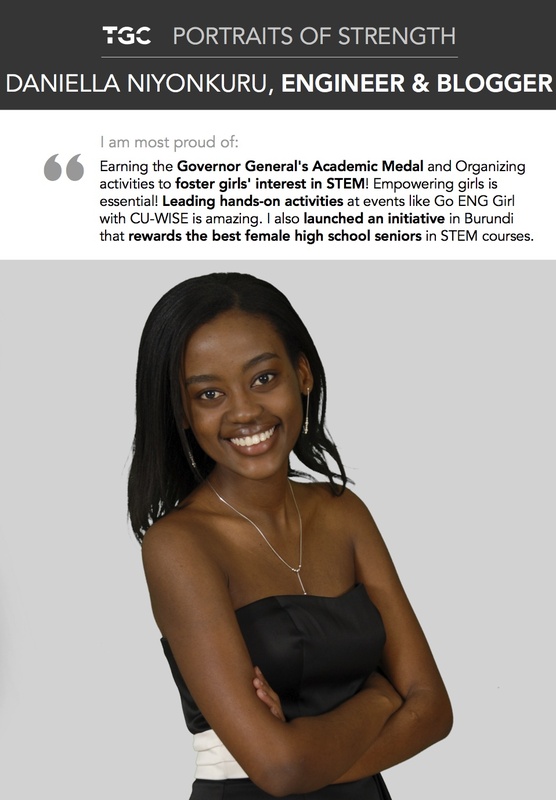 I also launched an initiative in Burundi that rewards the best female high school seniors in STEM courses. The biggest obstacle I have faced is believing in myself (aka the impostor syndrome) and overcoming my natural timidity. I have learned that failure is an option but fear is not! My advice to women is go! Be Bold, Be Positive and Change The World. You might be a minority in your field but it doesn’t make you any less better! Take up the challenge, think big and keep persisting. Always believe in yourself especially when no one else seems to! Make things happen!